Although we have major medical insurance, we never expected that one of our children would have a rare disease that could not be treated successfully close to home. Through our fundraising efforts we have been able to get Hank to NYC four times and stay the necessary amount of time for consultation, surgeries and recoveries. Hank has had four surgeries since July of 2009, traveling to NYC and Wisconsin, with another surgery scheduled for June 19, 2014 in Wisconsin. Because Parry Romberg Syndrome is considered "incurable" we don't know what to expect as Hank grows. We continue to fundraise to pay off the outstanding medical costs not covered by insurance, Hank's future surgeries and care as well as to be able to continue in our awareness-raising campaign. Hank has been through so much and we are so proud of his generous, courageous and compassionate heart. By allowing us to share his story with others and raise awareness, we have been able to help many other PRS families find the help they need and to have the courage to get through it. All money raised goes into the Helping Hands for Hank Trust Fund. *Our fundraising efforts have been put on hold lately. Hank is facing surgery mid-June 2017, in Seattle Washington. But with 2 working parents and three active children, we have not had the time to put towards active fundraising. We are now just focused on getting Hank there and our prolonged stay in Seattle as he recovers before we can fly home.We will see what insurance takes care of and renew fundraising to pay off the bills when we returen. Friends have started an online fundraiser for Hank. We are trying to raise at least $5,000 to cover the cost of this 5th surgery. Our goal is to raise much more to fund our awareness raising efforts and hope for research. 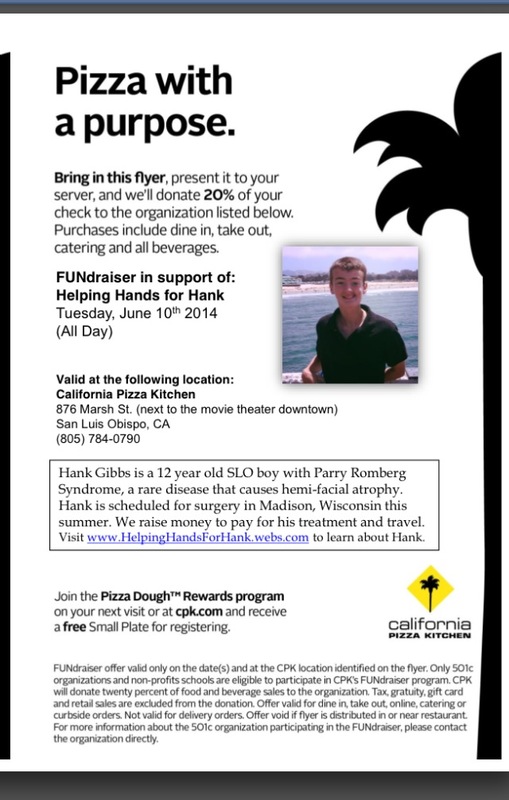 MARK YOUR CALENDAR for Tuesday, June 10 to dine at California Pizza Kitchen and support Hank! Located at 876 Marsh Street at the Downtown Center! Bring in the flyer and let them know you are there for Hank! Flyer and more information to come! We are very fortunate to be a part of not one, but two very loving and giving communities: Both in Elk Grove, CA and also in our home town of San Luis Obispo, CA. We are surrounded by good friends, family and even strangers who have rallied around Hank! Thank you to all who have opened your businesses to us, donated raffle and auction items, and for those who have worked diligently to make these fundraisers a success! Special thanks to McConnell Estates Winery: "Evening at the Winery for Hank" 2009. Thank you for all who contributed to making this such a successful event! The Elk Grove community really came through for us and we are so grateful for all the support! The success of this event is due to the hard work and dedication of seven exceptional women: Patty Wackman, Barbara Arthur, Susan Hopkins, Barbara Wackman, Deborah Larson, Lynda Castle and Ann Figueroa. Special Thanks to Mike and Patty Wackman and the rest of the Wackman family for donating the use of their winery. Thank you to their wonderful staff for donating their time and thank you to our brothers-in-law, Chuck Arthur, Stephen Hopkins and Howard Wackman, for helping with the event. And thank you to good friend Kim Crawford for running the ticket booth and greeting the guests. This truly was a group effort and we thank ALL who were involved! !